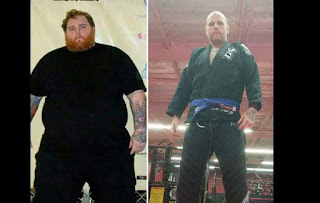 Jiu-jitsu.News: Jiu-Jitsu helped man lose 117 kg! Jiu-Jitsu has been a magnificent instrument for transformation of the multitudes. Weight loss success stories are by no means rare but this one is quite spectacular. It features the loss of whooping 117 kg! Jon Orton told his unique story. Just 4 years ago he weights a staggering 217 kg. Still he kept on going to class and working it around his schedule.